If you’ve ever had the privilege of seeing someone use an ear candle, then you know how the process is supposed to extract toxins and impurities. Well, Professors Stephen Trumble, Ph.D., and SaschaUsenko, Ph.D., of Baylor University are now employing a similar practiceto reconstruct contaminant and hormone profiles in whales. The result: more knowledge about how we affect and pollute our bodies of water. Since the erection of modern cities, we know we have disturbed ocean life with everything from ship traffic and noise pollution to chemical contaminants and climate change.But now, by analyzing the thelipids and keratin protein or cerumen of whales (whale earwax or earplugs for short), researchers can actually gauge the lifetime exposure of a whale to pollution. The alternating layers of dark and light in these plugs correlate to seasons of feeding and migration thereby approximating a whale’s age not unlike the inner rings of a tree. "Scientists in the past have used this waxy matrix as an aging tool, similar to counting tree rings. Then, the question arose: Could whale earwax chronologically archive chemicals, such as man-made pollutants?" said Usenko, assistant professor of environmental science in Baylor's College of Arts and Sciences. "Whales are free-ranging animals and you can't get these types of profiles or information on free-ranging animals in any part of the world. This has never been done before," said Trumble, assistant professor of biology in Baylor's College of Arts and Sciences. 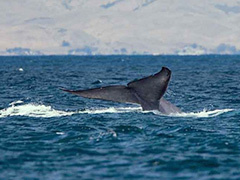 The most recent study concerns an endangered blue whale killed by a ship near California. The blue whale’s earplug revealed that levels of stress hormones doubled over the course of its life as it struggled to cope with a man-made handicap. We now know just how much damage we’ve done by dumping excessive amounts of flame retardant chemicals and other pesticides into the ocean for far too long. Posted on September 30th under Pollution Reduction.